​The JLL S300 is a treadmill that the whole family can enjoy and comes with the lowest starting speed I've seen available in the UK of 0.3 km/h. 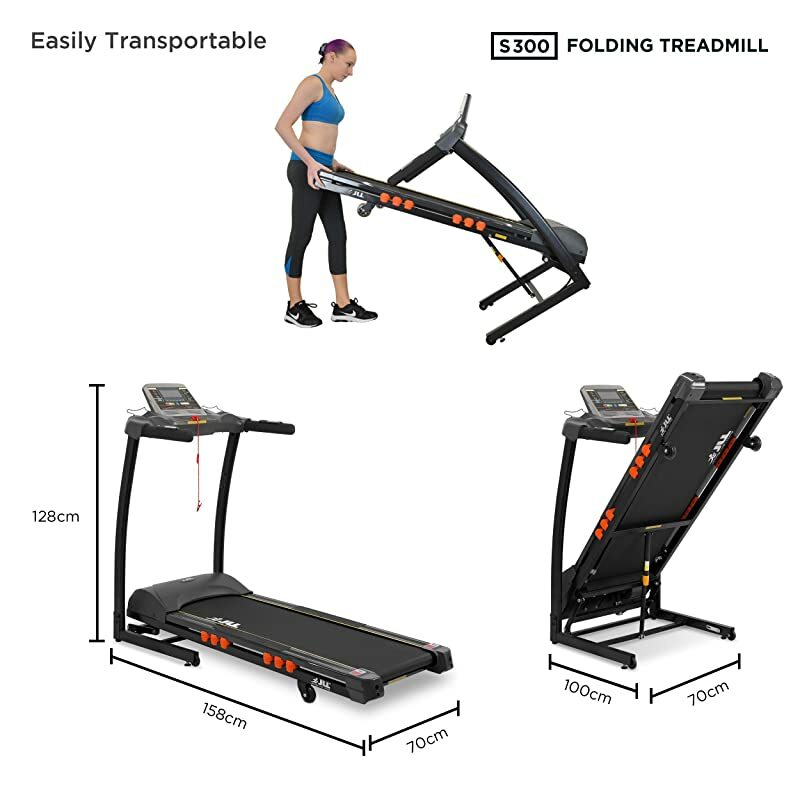 ​But before we dive into the features and performance section of our JLL S300 treadmill review, let’s take a look at some of the standout specifications. ​The LCD display not only includes your current run statistics, but it also ​comes with 15 preset running workout programs to get you started. You can also create your own workouts with three ​​programs ​you can customise to your own needs. 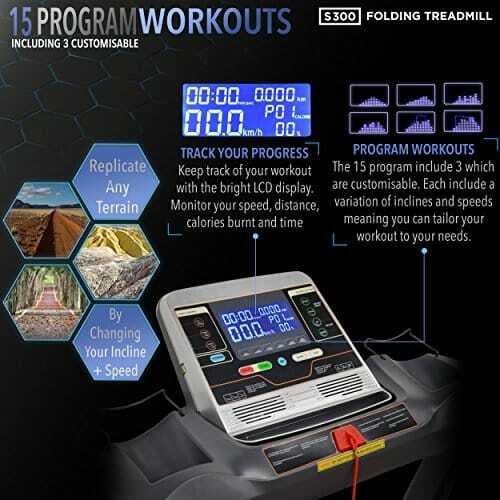 The LCD display includes: Time, Speed, Heart rate, Calories burned, Incline and Distance run. You can also connect your device audio directly to the treadmill speakers either with the USB or auxiliary (headphone jack) slots available. Boasted as the slowest starting speed in the UK. The JLL S300 offers a very smooth start of 0.3 km which is great for an easy warmup or for older users focusing on gentle walking. As you progress, you can increase the speed up to 16 km for a very fast run. An incline setting is available that will allow you to change the incline between 20 different levels of difficulty. This allows for up to 4 times the calorie burn when on the highest level setting. The shipping was great, but the instructions (as usual) left a little to be desired during assembly. I recommend you have another person help you with assembly ​so one can hold the ​parts in place while the other attaches them. ​However once assembled, this machine is very stable and seems very durable​. As your feet hit the treadmill’s ​running deck, they will trigger the 16-point cushioning system underneath​. This dampens the noise of your foot hitting the running deck, and makes it a little easier on your knees. This is one of the features you start seeing when you invest a little more in your treadmill. The running experience on the JLL S300 is pretty spectacular for the price. You have ​a range of features and speeds you can work up to in an effort to burn more calories ​as your fitness improves. It a treadmill that you can stay with for many years. 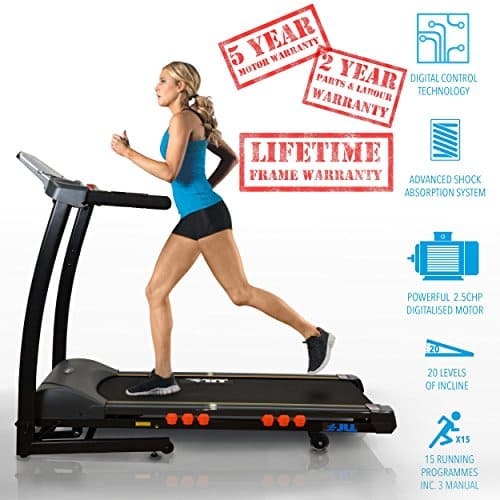 ​My final assessment for this JLL S300 treadmill is t​hat it comes with many premium features, is easily programmable and offers ​​excellent durability with an ​impressive build quality. It is one of my favourite mid-range treadmills and I have personally recommended it to ​friends.